Over 3,000 war graves maintained by the Commonwealth War Graves Commission (CWGC) can be found in burial grounds across Ireland. But most of the dead remained where they fell, commemorated by seas of crosses in European cemeteries or by monuments to the men whose mortal remains were never found. For the majority of families, their relative’s grave was marked in a country far beyond their means to visit. Some wealthy families did commemorate their dead in local churches with windows or wall tablets, bringing memorialisation into communal public spaces. 1 Most families could not afford such expensive memorials, but the family burial plot was an appropriate space for private commemoration with a public purpose. A gravestone could articulate personal loss while also acknowledging the significance of a death on the battlefield. 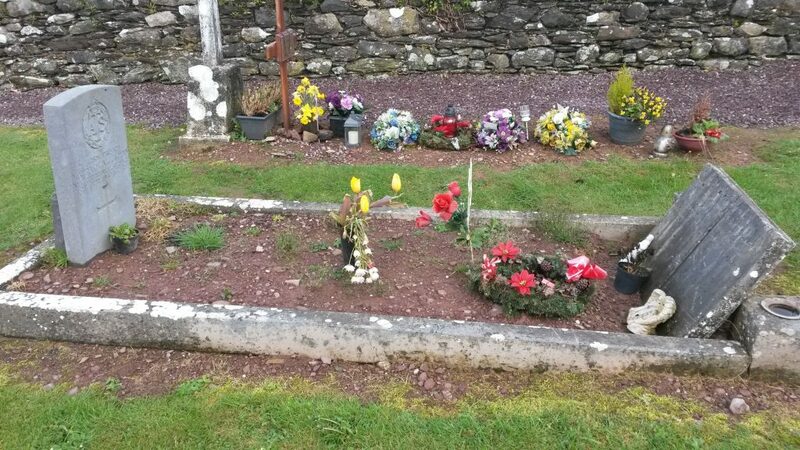 In St Mary’s, Curraghkippane, a rural cemetery that is a traditional burial ground for Cork city residents, I visited 14 CWGC markers, including one to Maura O’Callaghan, an Auxiliary Territorial Services casualty who died in 1947. 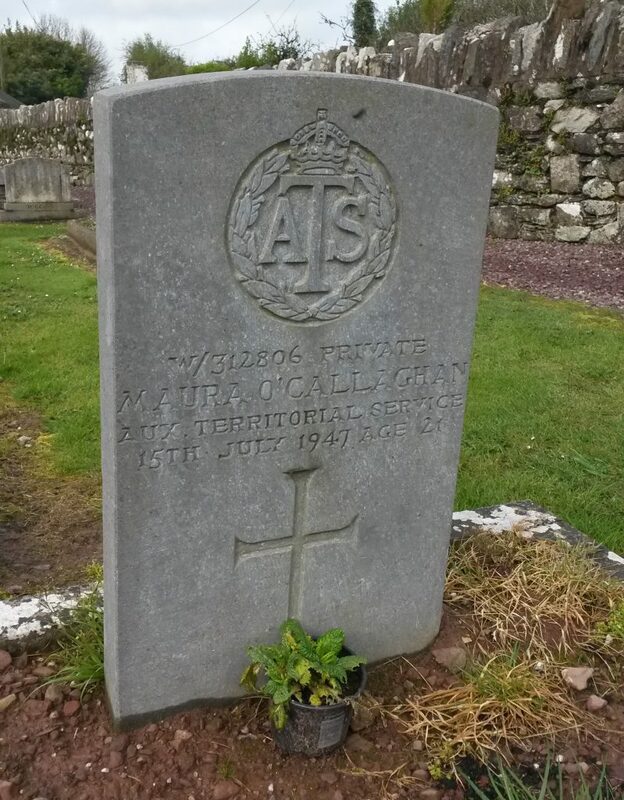 The war grave headstone is incorporated into the O’Callaghan family plot, which is still tended and maintained. But the homemade, personal war grave of the Burke family is the most memorable military monument in the crowded burial ground where centuries-old stones are being superseded by contemporary and shiny black marble headstones. A concrete monument, topped with a stone cross inscribed with the words ‘Watch and Pray’ has been embellished with regimental badges and three widow’s — or dead man’s — pennies. These were plaques that were issued to the next of kin of World War I casualties between 1919 and 1920. It is unlikely that those plaques are the original bronze pennies received by the family; most were safely stored in drawers, but some were mounted on church walls or in memorials. 2 I do not know whether it was common practice to integrate the plaques into family graves. Here, plaques to Stephen, Cornelius and Edward Burke were placed alongside their regimental badges. Luckily for me, the family erected another headstone next to this homemade war grave. This is a lineage or genealogy headstone, since it was erected by a relative to commemorate his family history and may not necessarily reflect individuals buried in the plot. 3 Such headstones are found in old cemeteries, where burial plots have been in continuous use for generations. The Burke family list on the main gravestone starts with an ancestor from the nineteenth century. It begins with Edward Burke, a soldier in the British army who fought in the defining military campaigns of the 1850s: the Crimean War (1853-6); and the Indian Rebellion of 1857, or the Indian Mutiny, as the British called it. According to the stone, two of his sons, Stephen, of the Leinster Regiment, and Cornelius, of the Royal Irish Regiment, died in World War I and are commemorated on the neighbouring cross. The final military casualty named was E. Burke, who was killed in Italy in 1944 while serving with the Irish Guards. 4 His son, Patrick, erected this monument, but the inscription omits a military casualty who appears on the adjoining monument. Who was Edward Burke of the Royal Munster Fusiliers, whose widow’s penny is above those of Stephen and Cornelius? The mysterious Edward has been omitted from the principal monument by the descendant who paid for the headstone. This headstone tells a family history through a military lens, as the other occupations pursued by non-military men and women are not recorded for posterity. Similarly ignored are the women who married these soldiers and bore their children. A family of invisible women and martial men is a excellent encapsulation of the army’s attitude to the reproductive role of women in military life. Women were necessary to produce soldiers but were barely acknowledged as part of enlisted men’s life. For Patrick Burke, who commissioned this headstone, the family tradition of military service started with his great-great-grandfather Edward in the Crimean War and ended with his own father’s death in Italy. These two memorials celebrate unreservedly the military achievements of selected family members. Military service defines the memorialisation of this family in a more profound manner than the official, austere War Grave Commission markers ever could. 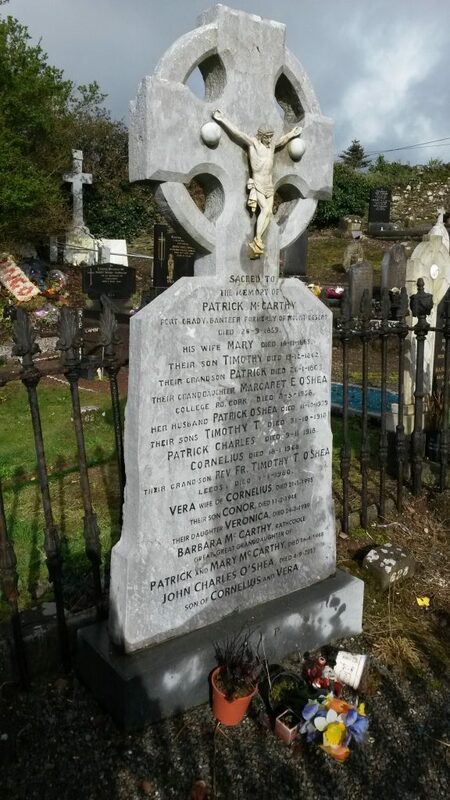 This entry was posted in Cemetery, Co Cork, Crimean War, Curraghkippane, History, Ireland, Memorials, Military, Urban, Women, World War 2, World War I. Bookmark the permalink. Very interesting post, I would suggest that the memorial plaques on the Burke memorial are actually the original ones issued to the family, while this is the first time I’ve seen this done in Ireland I’ve seen several examples from England, there are also more obscure examples of the soldiers campaign medals being set into the memorial too. It would be very interesting to find out when this memorial was erected if at all possible. Are there many examples of this in England? Not that Google is everything but I couldn’t find any pics of such gravestones on it. Unfortunately, there will be no records of when this was erected – finding complete burial records for cemeteries like this is unusual enough. I’ve maybe seen pictures of 5 or 6 in England and mentions of others, some in Australia too, while not common place it does seem to have happened. The details of them aren’t shared for obvious reasons as there are examples with missing plaques… Shame about the cemetery records! Oh dear, I never thought that people would steal them. I hope that doesn’t happen! Oh, also as it may be of interest and as the Leinsters are my own area of interest, Stephen Burke had some 8 years prior service in the army and was a veteran of the Boer War! Thanks for that correction – I couldn’t read it properly. Will rectify. Good to know that he was professional soldier, that explains the significance of the family commemoration of military service. 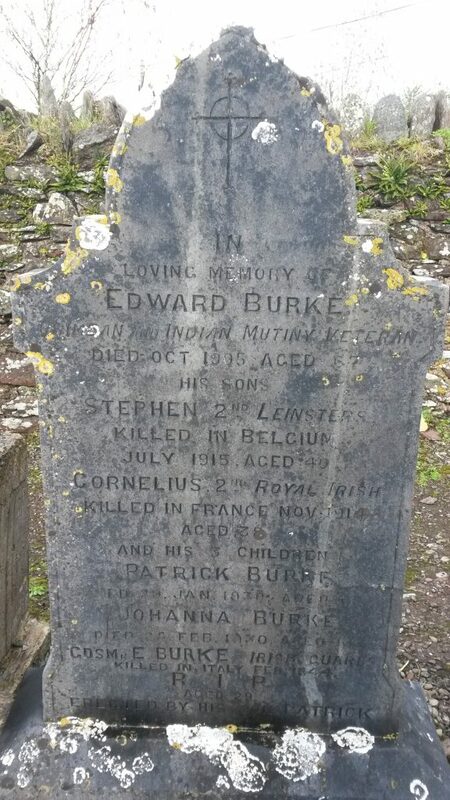 You will find that Edward Burke might well be the old father and that he served during the Indian Rebellion/Mutiny with one of the two Honorable East India Company ‘European’ regiments (101st and 104th Regts of Foot) that were merged in July 1881, to create the Royal Munster Fusiliers. 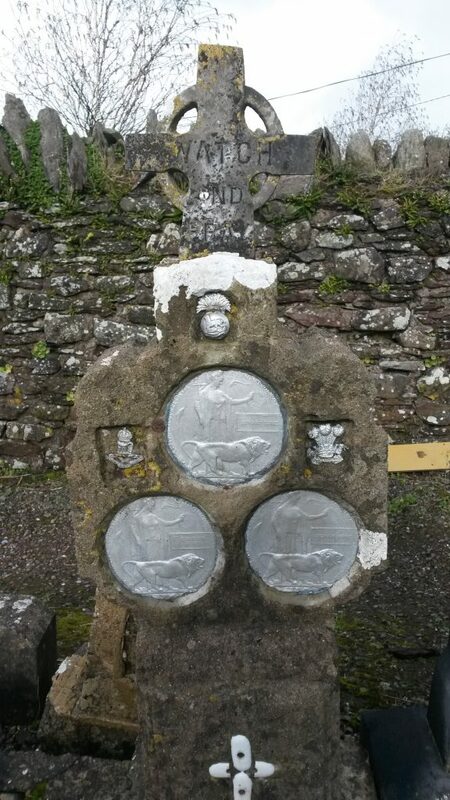 I strongly suspect that when it was decided to commemorate his two soldier sons the family opted to have badges for the three family regiments mounted on the stone, along with the two dead mens pennies for the son and a specially commissioned copy for the of father. I considered this. If only there was a way to prove it! It is quite a statement, equating WW1 and other Imperial wars. I agree, but it should be possible to trace his (the old father’s) record, albeit that one aspect in my theory requires that the old father served in a different regiment in the Crimea to that in the Indian Rebellion/mutiny. The name seems too much of a coo incidence though, given that there is no mention of a son by that name in the genealogy/family line stone. The RMF HEIC forebears (very many of them Irishmen) fought very hard in India in 1857-58, whereas the Leinsters and Royal Irish were both regiments of the old Queen and that is another reason why I think my theory may hold true. Sorry Aoife, I only just saw this. It might well be THE Edward as you say. It just seems really odd to me that he is not listed separately on the genealogy head stone. The Leinsters were raised by the Canadian government for service in India during the Mutiny. It was given the ordinal 100th Regiment. When it arrived in the UK it was presented with Colours bearing the battle honour Niagara, awarded to a previous 100th Regiment which also bore the title County of Dublin. In May 1881 in the Childers Reforms it was amalgamated with the 109th Bombay Infantry Regiment as the Prince of Wales’s Royal Canadian Regiment. In July 1882 the title was changed to The Prince of Wales’s Leinster Regiment (Royal Canadians). BTW, thank you for posting such an interesting topic. I’m glad you liked it. I write about what catches my eye, and it was irresistible. It is curious and perhaps significant that neither of the old father’s sons joined the only two, stand-alone successor regiments of the HEIC’s (technically mercenary) European infantry, the RMF and RDF (some other battalions were merged with English regiments in 1881), but chose instead to join Imperial regiments, one of them, the a Royal Irish and erstwhile 18th Regt of Foot and thus most senior regiment of Ireland. It makes me surmise that the 18th might well have been the old father’s regiment in the Crimea, where they gained laurels at Sevastopol, and that he perhaps then left the Queen’s service for the HEIC, whereupon he found himself fighting in the mutiny. Methinks there may be yet more to this story. It could be a research rabbit-hole alright! Aoife – interesting about military attitude to wives/mothers. I do note that married quarters are shown in Collins Bks, Cork on the 25 inch map so pre WW1. Yes, some women married ‘on the strength’ but the Army as an institution was deeply reluctant to make provision for service families, and did so very grudgingly. The very first married quarters were an initiative of one regiment’s officer corps! I am deeply impressed by your knowledge Aoife. Please come and join the Victorian Wars Forum. Thanks for both the compliment and invite! You would be very welcome there and find much of interest I think. Incidentally fellow forum members there have identified an Edward Burke, who served with the 13th Regt of Foot in both, the Crimea and Indian Mutiny. Just to give your some more info, this is my families grave on my others side. The Original Edward mentioned is my Great Grandfather, as stated veteran Indian Mutiny and the Crimea. His sons Stephen and Cornelius both died in the 1st War, the Edward who was in the Royal Munster Fusiliers and who died 31st July 1917 was actually Edward seniors Grandson,his Father was also Edward, what you don’t see on the photograph is to the left there is a further memorial stone,which commerates the Royal Munster Fusilier Edward and was put there by his Father who is buried there alongside Edwards mother who died during child birth leaving Edward senior to bring up 4 children including Edward alone. Patrick who built the memorial is actually old Edwards son and he is also buried in the grave alongside his mother Johanna, they died within a month of each other in Jan/Feb 1930. The Edward who died in Italy(Anzio Feb 1944) is old Edwards grandson and my mothers brother, I know its confusing, the Burkes had a tradition of calling at least one son Edward, usually the eldest. Stephen is buried Potijze Burial Ground Cemetery and Edward Potijze Chateau Lawn Cemetery probably 1/2 mile apart. Cornelius has no known grave and is remembered with honour at Le Touret Memorial. Its Edwards Centenary in July as he died on the 1st day of Passchendaele and I will be attending, I have been to his grave and Stephens many times and Cornelius’s memorial. Not surprisingly young Edward my Mothers Brother inspired by tales of the families military service, he joined the Irish Guards and was a career soldier until he died aged 28, he was the eldest hence the name Edward following on the family tradition. The grave contains my Mother and Grand Parents and has a modern headstone, the last person buried there was my Uncle Patrick my mums brother, not to be confused with my Great Uncle Patrick who had the original headstone built, although it was owned by his brother Edward, there are no links to that Edward Burkewise,he had 2 daughters his other son who I didn’t know died in Southampton in 1986 and I was informed he also served in the army which one I don’t know but can only presume it was the British Army. I am still in contact with Edwards descendants today, the only Burkes left are my Uncle Patrick who had sons and grandsons so the name lives on. It was interesting to find out that Stephen was a career soldier and veteran of the Boer war, we suspect Cornelius also was a Boer war veteran, both were bachelors as was Patrick who lived with his mother until his death , Cornelius was born in Salford, Manchester, Stephen in Clonmel, their brother Edward Tipperary according to the 1911 census although the 1901 states Wtareford as his place of birth,Patricks was Tipperary also, my grandfather was born in Cork obviously due to Edwards postings his children were born all over the place, we believe the Family are originally from Cork. On mystery in the Family there was another brother John, he was in the 1901 census living with my Great grandmother Johanna and Patrick, but missing from the 1911 one, one theory is a family disagreement and he left for foreign shores never to return, or joined up again never to return, he certainly wasn’t a causality of the 1st War, I’ve checked, there was six brothers all together, 2 died in war 3 natural causes, whatever happened to John no one knows, there was a photograph hanging up in my granddads house of all six of them together, but that’s disappeared as well, as with all families you don’t ask the questions when your parents/grandparents are alive, there is so much I wish I had asked my Mum, but she sadly passed away in 1990, at least we try and keep the memories alive, a lot of the family have visited Ypres, Le Touret and Anzio. My granddad god bless him had hardly left Cork let alone Ireland, but just after the war he was flown over to Italy as part of a party and had an audience with the Pope and then visited his son Edwards grave, we have photographs of this,I don’t know who paid, either the British Government or the British Legion, but certainly he would not have had the means to pay. I was then the next member of the family some nearly 60 years later to visit, since then a lot more have visited his grave. Thank you for posting such an interesting rundown of a family that provided so many soldiers for the famous Irish regiments of the old British Army. One aspect you do not seem to mention is the actual regiment of the original Edward on the memorial, he who fought in the Crimea and Indian Mutiny. It would be great to confirm his regiment? When I posted his name in the Victorian Wars Forum online a fellow there traced an Edward Burke who had received campaign medals for both wars to the 13th Regiment of Foot. It would be nice to report back if that is indeed him. Thanks again. Wondering would the Cwgc upgrade a war veteran grave in Whitehall Co Westmeath ,he served with the Leinsters during world war 1, his name was Bernard Masterson from Longford. I’m sorry, I have no idea how the CWGC decides to add graves to its list. A. Sorry Aoife, I meant that last question for Dennis. Robert, sorry we have no idea what regiment he served in, I know his son Cornelius was born in 1861 Salford Greater Manchester, so obviously his regiment was based there then.